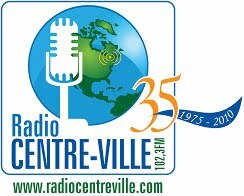 Montreal’s Radio Centre-Ville, or CINQ FM as it is also called, is located at 102.3 FM on your radio dial. Be forewarned, reception can be a challenge at the best of times, so your best bet may be to either use the station's Internet feed or listen to podcasts of the various programs. The station is housed on St. Laurent near Fairmount, in the "Mile-End" district. I was given the phone number of someone who was involved at the station as my radio course was wrapping up. It was supposed to be for a potential internship. I would later learn that there are no internships at the station. The fact is that anyone can walk in off the street and be given a chance to be introduced to radio broadcasting and production. That's actually pretty cool. One of Radio Centre-Ville's main principles is to give people who wouldn't otherwise get an opportunity to do radio a chance to get on the air. Multicultural, they broadcast in seven languages. Having only a hand full of employees, the station depends on volunteers and members to keep things going. The english "team" as it is referred to, occupies a time slot from Friday evenings to late afternoon on Saturdays. I was given the opportunity to get involved with the Scottish Voice program in late February of 2009. When I first arrived at the station, I had no idea what my role would be and didn't know much, if anything, about Scottish culture or music. I ended up taking over the technical production of the show. I've also been given a chance to join in on the air. The weekly Gaelic lesson is always fun! I've also helped out other shows since I started volunteering at the station, both in production and on air. Most recently, I've become involved with the Digital Life Show. It's true what they say, the only way you learn something well is by doing it. It doesn't matter how much time you spend simulating a broadcast, unless you actually get into a real studio you won't learn much of anything. I had never op-ed a board before. It's not just a matter of learning the board, but the way the hosts want things done. It seemed straightforward enough, but being in synch with the host(s) way of doing things is half the work. There's also much work to be done in preparing for a show, especially when you don't have a "staff" to do it. Such is life when you are on community radio. It's a wonderful place to learn.